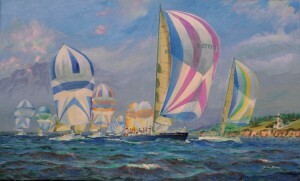 Four times the Yachting World Prize artist at Rolex Swan European Regattas in that, Gordon Frickers remains unrivaled. 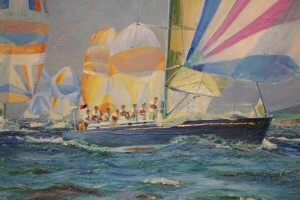 Gordon had accepted the tricky task of providing a framed painting of the winning yacht for presentation at the Royal Yacht Squadron a mere 2 hours after the racing finished. This spirited marine painting measuring 61 x 91 cms (24″ x 36″), oils on canvas, available. Ask for details, contact us. 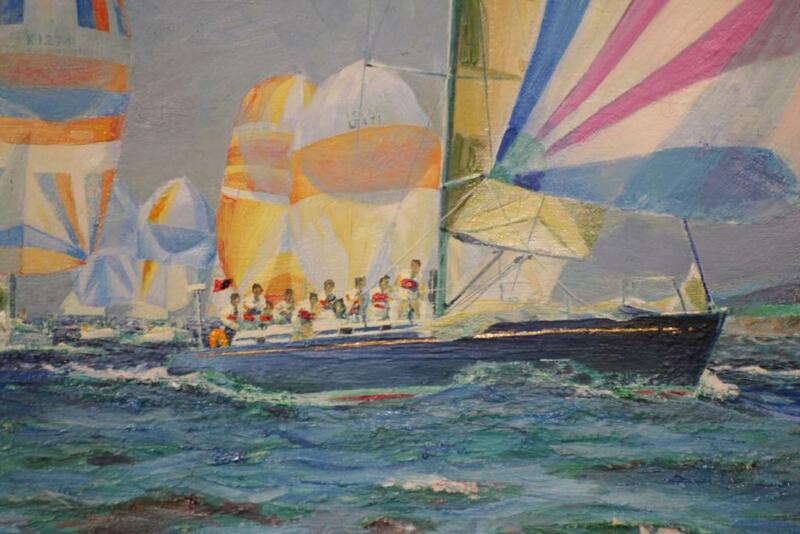 This painting celebrates the sheer joy of sailing some of the world’s most beautiful yachts, finest of the production built boats, the Nautor Swans, as hard as possible in the classic locations around Cowes and the Solent waters. These Swan yachts are pictured off St Katherine’s Point most southerly point of the Isle of Wight rounding the island to re entered the East Solent to finish at the Royal Yacht Squadron off West Cowes. One of the many happy results of the Rolex Swan European Regattas was Yachting World inviting Gordon Frickers to provide prizes over a number of years, a painting of the winning boat of the last race. Nautor’s Swan class yachts are considered by many the ultimate in ocean-going, luxury sailing yachts of unrivalled build quality and performance. Nautor’s Swan regattas attract the world’s elite to the most stunning yachting locations for competitive racing, relaxed sophisticated social events and to be part of the Swan family. The Swan European Regatta is a biennial yachting event hosted by Nautor’s Swan on the Solent while the Royal Yacht Squadron provides an elite ‘polish’ ashore.